The spectacular Tamur combines an exhilarating river expedition with one of the best short treks in the Himalayas. Starting at Biratnagar we trek for 3 days upto a 10,000ft pass above the sacred lake. With the most magnificent views of Everest and Kanchenjunga, we descend into the lush valley arriving at Dobhan to start our amazing river expedition. The first rapids are powerful and continuous, hemmed in by steep canyon walls. In the middle section the river opens up and there are beautiful white sandy beaches. The last few days where the river turns back to the west is phenomenal. Towering waves leap skyward, with seemingly endless rapids. For people who want a trip that combines a spectacular short trek with intense whitewater, the Tamur is without a doubt the river to run. An unmissable trip! Arrive in Kathmandu. You will be met by an AdventureX Guide and then taken to your hotel for the evening. Hot shower then out to one of the many local fine restaurants. Have the day to explore the amazing city of Kathmandu. Grab a taxi or rickshaw to visit some of the incredible temples and squares that make up this most vibrant of capitals. At 6pm we will have a pre-departure briefing then head off for a meal together. Transfer from Kathmandu to Basantapur for over night camp. Trek to the start of the river. Some 40 porters are hired to carry all the equipment during the three day trek allowing us to concentrate on the amazing views of Kanchenjunga, Makalu and the Everest massif. This is one of the most stunning short treks in Nepal. We put onto the river, tackling the rapids of the Upper Tamur, powerful and continuous, hemmed in by steep canyon walls either side. 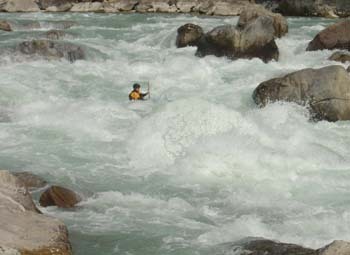 The river then opens out more, revealing more great whitewater and amazing sandy beaches. The Lower Tamur is without a doubt one of the most exciting things you can do in Nepal, and quite possibly one of the best short rafting sections offered anywhere in the world. A full day on the river brings us to the sandy camp at the confluence of the Sun Kosi. The final day we raft the Sun Kosi to Chatara. Transfer back to Kathmandu. Free time in Kathmandu for shopping, sight-seeing etc. After a rather leisurely breakfast we take you back to the airport for your return flight to Kathmandu. Price includes: Airport pick-up and drop off, all accommodation, all meals, guides, all transport during trip, permits, national park fees.